When you pair with Holy Champion, sets you up with a quick hard hitting minion. If you build a deck knowing you plan to abuse this guy, he's seriously OP. Faceless Manipulator, but then with mage, the other card duplicating. Or have him take some damage from a hopeful opponent, then panda him back and out again. Or shadowstep with rogue. Try this baby with coldarra drake. Pretty nice damage/heal output. Control warriors best friend. Anti-aggro's nightmare. 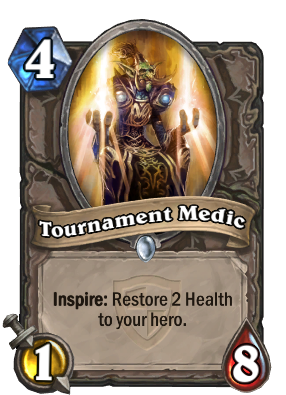 This combined with Justicar gives me 6 health heal off of hero power. The best part is his voice. Or better yet, Confuse, now that that's a thing. I've got a healadin deck with Light Wardens in it that would like this guy. I'd take him out for a spin. At first i thought Priest. Now I'm thinking warlock! 4/5 or 3/6 is pretty overpowered if you ask me. Theres already Chillwind Yeti , and this card would be strictly better than that. But 2/7 would be way better.